Heliomalt modpack has an installer that allows you to choose different XVM configurations as well as several selected mods that you do not need to install. Mods are installed exclusively in the mods and res_mods folder, the download takes place in the main WoT directory in the Heliomalt subfolder. Therefore, there is no need to look for installing different mods and modifications. The installer has the ability to clear the mod, the res_mods folder and the WoT cache before installing, without deleting settings (preferences.xml) and any existing XVM settings. The “Remove WoT Cache” option should be selected during the first installation and, as a rule, no longer needed. Important!!! This modpack can use players with color blindness. In addition to the settings in World of Tanks, the installer offers two more tools for color blind. After setting up “Blindness”, go to the HP Team panel, which is also customizable. Therefore, if the option “With the HP Bar team” is selected, check the “Additional support for color blindness” box. 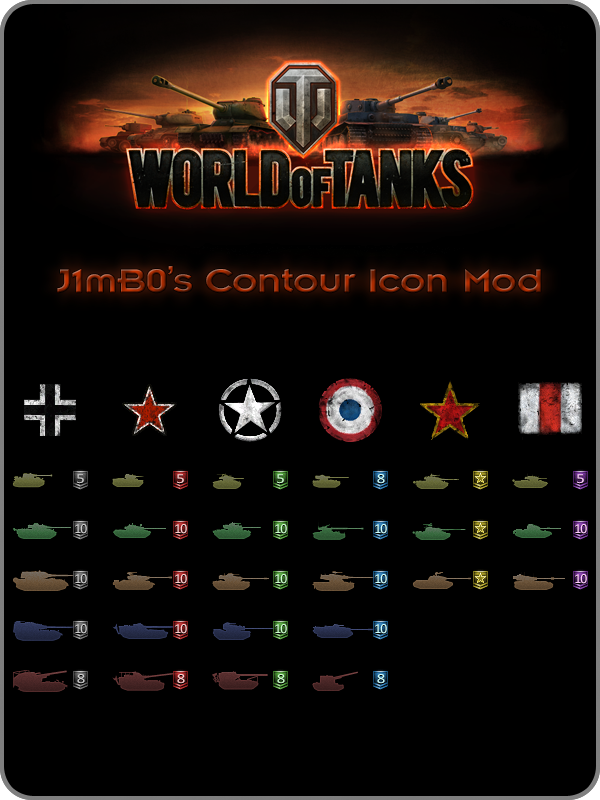 To optimize the appearance of the World of Tanks, the gamer can install modpack GeeMod 2. Modpack is an updated version of the well-known modpack Geemod, which contains a number of mods that perform functions to eliminate the appearance of the game. The assembly software will help you quickly deliver the necessary modifications to the client without spending time searching. Modpack installer has its own unique style, in which you can update the range provided, as well as manually choose the content to install. Each version has a description of its features, as well as screenshots that help you see how it looks in the game. In the list of mods there are those that change the look of the sight, icons, and also provide another functionality. The player only needs to select the necessary ones and click on the installation, after which GeeMod 2 will automatically install the selected set of modifications. This will help the user quickly download the necessary content to the client without spending time finding suitable modifications, but concentrating on battles and attempts to win them. A competent selection of modifications will significantly increase the chances of a successful game. Meet one of the best programs to raise the FPS game. In this program, there is only one drawback – it is completely in Russian. But do not worry for you, we have translated it into English. Put a mark beside the effects that you want to disable. Every time we try to surprise our players new mods with additional features and advantages. But mod that we want to offer today does not apply to such. This mod does not have any extra features or additional functions. It’s just a black hangar in a minimalist style. Having installed the mod itself you will get a dark hangar and a bright spot in the center of the garage, thanks to which the inscription Wotspeak is perfectly visible. If you are a fan of this modpack or a fan of minimalist style, then this mod is for you. Perhaps the main advantage of mod is the fact that it does not sit on FPS and is excellent for owners of weak computers. You can improve your hangar interface with mod colored lights of selected tank in carousel. Mod almost does not have practical use and does not give the player an advantage in battle. You can only improve your hangar interface and get comfortable and intuitive carousel in the hangar. But it is great. Now you can get bright, illuminates carousel of tanks and can accurately select only one tank, which you need for battle. Player expect 10 different color variants of mod. Author of modification is Atmaxx. [1.2.0] Mod “Lost time” – statistics for the session, tanks, maps, etc. You can get information about World of Tanks player by looking at his statistics. For some, this data does not matter. For others very important. And it becomes clear why the “Lost Time” mod appeared, displaying statistics for the session, tanks, maps and much more. Under the confusing name are hidden truly grandiose possibilities of this modification. Thanks to it, a lot of very necessary and detailed information appears in the system channel. Statistics of the receipt of game silver and the accumulation of experience; the damage that the equipment received in combat and the costs associated with it; bans, time spent in hot fights. Of course, there are combat effectiveness ratings (EFF, WGR and others). Information about the last battle is painted as if in the battle to the player’s tank was attached a lot of fixing devicesand video cameras. There are data on which the “tanker” can easily determine how successful the battles of the current session were. Or vice versa, it was not worth playing this time. Several shameful “sinks” of the team have brought to naught all the previous positive results. In addition, the modification has a lot of settings. Using them, you can display data on one parameter, and do not use the others. There are options for assigning “hot” keys, with the help of which interesting data can be seen not only in the hangar but also during the battle.